A medium to long (up to 1,900 mm or 75" in total length), plain blue-green, brown, or olive colored snake with a creamy yellow or white underside. The eyes are large and the body is slim. 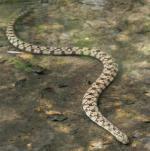 A medium-sized (up to 1,115 mm or 44" in total length) gray, greenish tan, tan, or brown snake with paired dark gray, brown, or orange spots running the length of the back. A small (up to 300 mm or 12" in total length), relatively thin, pink or mauve snake that resembles a shiny earthworm. Both the head and tail are rounded and blunt. Adults are 24-40 inches (76-122 cm) long. It gets its common name because it has no patterning on its underside. This stoutly-built aquatic species is generally brown to olive with a dark, chainlike pattern down the back. The belly is yellowish with dark, half-moon spots that occur irregularly but are concentrated at the sides. Considered harmless to humans, but the snake's saliva may produce inflammatory reactions around the site of a bite. Adults average from 24-42 inches (61-106.7 cm). The record is 62.5 inches (158.8 cm). Stout bodied snake with broad black, brown, or red crossbands over most of body. Average adult size is 30-55 inches (76.2-139.7 cm), record is 69.5 inches (176.5 cm). Adults are light tan with darker squarish brown blotches on the back.